One of the principal results from the Strategic Highway Research Program (SHRP) was the Superpave mix design method. The Superpave mix design method was designed to replace the Hveem and Marshall methods. The volumetric analysis common to the Hveem and Marshall methods provides the basis for the Superpave mix design method. The Superpave system ties asphalt binder and aggregate selection into the mix design process, and considers traffic and climate as well. The compaction devices from the Hveem and Marshall procedures have been replaced by a gyratory compactor and the compaction effort in mix design is tied to expected traffic. American Association of State Highway and Transportation Officials (AASHTO). (2000 and 2001). AASHTO Provisional Standards. American Association of State Highway and Transportation Officials. Washington, D.C. When SHRP was completed in 1993 it introduced these three developments and called them the Superior Performing Asphalt Pavement System (Superpave). Although the new methods of mixture performance testing have not yet been established, the mix design method is well-established. Superpave specifies aggregate in two ways. First, it places restrictions on aggregate gradation by means of broad control points. Second, it places “consensus requirements” on coarse and fine aggregate angularity, flat and elongated particles, and clay content. Other aggregate criteria, which the Asphalt Institute (2001) calls “source properties” (because they are considered to be source specific) such as L.A. abrasion, soundness and water absorption are used in Superpave but since they were not modified by Superpave they are not discussed here. Aggregate gradation influences such key HMA parameters as (read about these parameters here) stiffness, stability, durability, permeability, workability, fatigue resistance, frictional resistance and resistance to moisture damage (Roberts et al., 1996). Additionally, the maximum aggregate size can be influential in compaction and lift thickness determination. 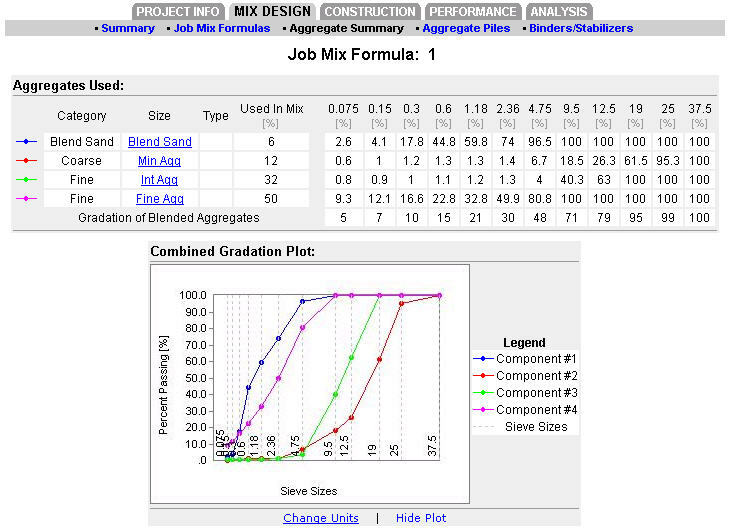 Superpave mix design specifies aggregate gradation control points, through which aggregate gradations must pass. These control points are very general and are a starting point for a job mix formula. It is rare to obtain a desired aggregate gradation from a single aggregate stockpile. Therefore, Superpave mix designs usually draw upon several different aggregate stockpiles and blend them together in a ratio that will produce an acceptable final blended gradation. It is quite common to find a Superpave mix design that uses 3 or 4 different aggregate stockpiles (Figure 1). Figure 1. Screen shot from HMA View showing a typical aggregate blend from 4 stockpiles. Figure 3. 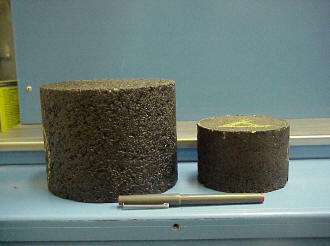 Superpave gyratory compactor sample (left) vs. Hveem/Marshall compactor sample (right). Ninitial. The number of gyrations used as a measure of mixture compactability during construction. Mixes that compact too quickly (air voids at Ninitial are too low) may be tender during construction and unstable when subjected to traffic. Often, this is a good indication of aggregate quality – HMA with excess natural sand will frequently fail the Ninitial requirement. A mixture designed for greater than or equal to 3 million ESALs with 4 percent air voids at Ndesign should have at least 11 percent air voids at Ninitial. Ndesign. This is the design number of gyrations required to produce a sample with the same density as that expected in the field after the indicated amount of traffic. A mix with 4 percent air voids at Ndesign is desired in mix design. Nmax. The number of gyrations required to produce a laboratory density that should never be exceeded in the field. If the air voids at Nmax are too low, then the field mixture may compact too much under traffic resulting in excessively low air voids and potential rutting. The air void content at Nmax should never be below 2 percent air voids. 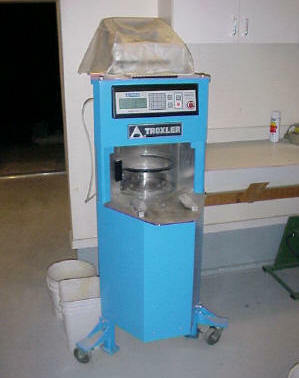 Typically, samples are compacted to Ndesign to establish the optimum asphalt binder content and then additional samples are compacted to Nmax as a check. Previously, samples were compacted to Nmax and then Ninitial and Ndesign were back calculated. Table 6 lists the specified number of gyrations for Ninitial, Ndesign and Nmax while Table 7 shows the required densities as a percentage of theoretical maximum density (TMD) for Ninitial, Ndesign and Nmax. Note that traffic loading numbers are based on the anticipated traffic level on the design lane over a 20-year period regardless of actual roadway design life (AASHTO, 2001). * When the estimated 20-year design traffic loading is between 3 and initial = 7, Ndesign = 75 and Nmax = 115. The original intent of the Superpave mix design method was to subject the various trial mix designs to a battery of performance tests akin to what the Hveem method does with the stabilometer and cohesion meter, or the Marshall method does with the stability and flow test. Currently, these performance tests, which constitute the mixture analysis portion of Superpave, are still under development and review and have not yet been implemented. The most likely performance test, called the Simple Performance Test (SPT) is a Confined Dynamic Modulus Test. Theoretical maximum specific gravity (TMD, Gmm). Generally, these values must meet local or State criteria. VMA and VFA must meet the values specified in Table 8. Note that traffic loading numbers are based on the anticipated traffic level on the design lane over a 20-year period regardless of actual roadway design life (AASHTO, 2000b). Air voids at Ninitial > 11 percent (for design ESALs ≥ 3 million). See Table 5 for specifics. Air voids at Nmax > 2 percent. See Table 5 for specifics. VMA above the minimum listed in Table 2. VFA within the range listed in Table 2. If requirements 1,2 or 3 are not met the mixture needs to be redesigned. If requirement 4 is not met but close, then asphalt binder content can be slightly adjusted such that the air void content remains near 4 percent but VFA is within limits. This is because VFA is a somewhat redundant term since it is a function of air voids and VMA (Roberts et al., 1996). The process is illustrated in Figure 4 (numbers are chosen based on 20-year traffic loading of ≥ 3 million ESALs). Figure 4. Selection of optimum asphalt binder content example: 4 basic steps. Moisture susceptibility testing is the only performance testing incorporated in the Superpave mix design procedure as of early 2002. The modified Lottman test is used for this purpose. AASHTO T 283: Resistance of Compacted Bituminous Mixture to Moisture-Induced Damage. AASHTO M 323 (Superpave Volumetric Mix Design) allows an agency to modify the required dust to binder ratio from 0.6-1.2 to 0.8-1.6 if the aggregate gradation passes beneath the PCS Control Point. Does your agency allow (or require) a dust to binder ratio of 0.8 – 1.6? If so, when is this allowed/required?